We have a large inventory of combination jumpers to choose from. We offer free delivery service to most of the greater Los Angeles area. 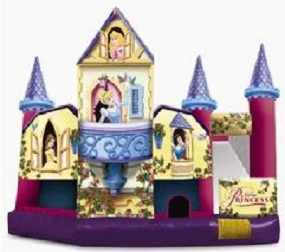 Disney Princess 5 in 1 Combo includes a large jumping area, basketball hoop, log and pop-up obstacles, a climb feature and a slide. Rent this unit today for as low as $239.00 a day. Unit dimensions are 18*19. Princess 3 in 1 as low as $189 a day. Just like the mini-slide but with a steeper slide. This unit is great for kids of all ages. Unit dimensions are 15w*18d. 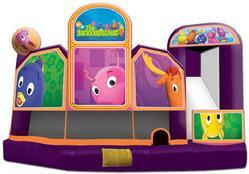 Princess Bounce and Slide as low as $219.00 a day. This unit has a large jumping area w/ a basketball hoop, a climbing ramp and steep, long slide. Unit dimensions are 19w*20d. Spring Princess Bounce and Slide as low as $189.00 a day. This unit has a large jumping area w/ a basketball hoop, a climbing ramp and a steep, long slide. Unit dimensions 17w*19d. Justice League 4 in 1 as low as $219.00 a day. This unit has a large jumping area w/ a basketball hoop, a climbing ramp and a steep, long slide. Unit dimensions 17w*19d. Tropical 3 in 1 as low as $179 a day. Just like the mini-slide but with a steeper slide. This unit is great for kids of all ages. Unit dimensions are 15w*18d. Deluxe Sports Bounce and Slide. Huge Jumping area, basketball hoop, popups, climbing ramp and extreme slide.19 x 20 As low as $219.00 a day. 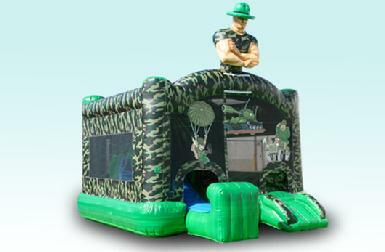 Tropical Deluxe Bounce and Slide starting a $219.00 a day. Large Jumping area, steep slide and basketball hoop. Check out our Army camouflage combo Jumper 17 x 20. Steep Slide, Large Jumping Area, Tunnel, & Baskeball Hoop. As low as $219.00 a day. 17 x 19 Combo Jumper. Steep Slide, Jumping area Climbing Ramp and Slide. Starting at 189.00 a day. Click on Themed Panel jumper page to see themes avail. Backyardigans 5 in 1. Large jumping area, baketball hoop, obstacles, climing ramp and slide. Starting at $229.00 for the day. Toystory 4 in 1. . Large jumping area, basketball hoop, , climbing ramp and slide. Starting at $199.00 for the day. Nemo 6 in 1 Combo includes a large jumping area, basketball hoop, log and pop-up obstacles, a climb feature, tunnel and a slide. Rent this unit today for as low as $209.00 a day. Unit dimensions are 18*19. Train Bounce and Slide Combo includes a large jumping area, basketball hoop,, a climb feature, and a slide. Rent this unit today for as low as $199.00 a day. Unit dimensions are 18*19. Disney Fairies Combo includes a large jumping area, basketball hoop,, a climb feature, and a slide. Rent this unit today for as low as $199.00 a day. Unit dimensions are 18*19. Orange County Jumpers has the best combo jumpers in the industry. They are made my Ninja Jumper. Our Combo jumpers have large jumping areas, Steep climbing ramps, basketball hoops and great slides. If you have room for a combo jumper they can really add to your child’s jumping fun. I love to watch my kids play tag in the jumper. When they have a slide they can now chase each other around and around. A combo jumper can fit in almost the same space as a standard jumper. For instance a standard jumper is 13 x 13 and our smallest combo jumper is 15 x 17. 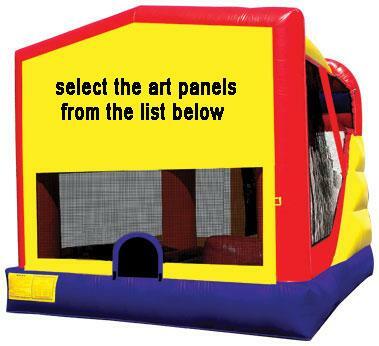 If it works for you budget the combo jumper is the best kind of bounce house for your child’s party. We have a wide assortment of combo jumpers to choose from. Orange County jumpers prides itself in its wide selection. We have more then 80 themes to choose from. Five Nights of Freddy, Frozen, Little Mermaid, Spiderman, Batman, Superman, Xmen, Avengers, Toystory, Harry Potter, Trolls, Pokemon, Power Rangers, Trains, Disney Cars, Mickey Mouse, Minnie Mouse, Alice in Wonderland, Shopkins, Halloween, Easter, Noah’s Ark, Race Cars, Transformers, Bubble Guppies. 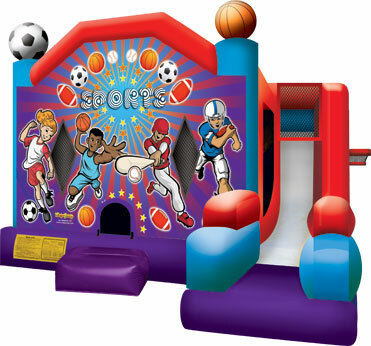 We would love to bring a combo jumper to you party if you live in Torrance, Westminster, Fountain Valley, Huntington Beach, Costa Mesa, Foothill Ranch, Irvine, Anaheim, Anaheim Hills, Yorba Linda, Tustin, Stanton, Seal Beach, Palos Verdes, Buena Park, Whittier, Orange, Cypress, Rolling Hills, Midway City, Fullerton, LakeForest, San Clemente, Santa Ana, Villa Park, Carson, Wilmington, Long Beach, La Mirada, and many more cities.